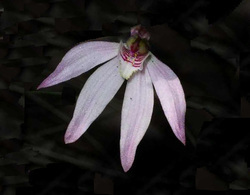 Often seen with just one flower but known to produce up to 5 per plant. Up to 30mm across. Colour pinkish white to deep pink. Lip has several red bars across it and dotted with 2-6 rows of hard yellow protusions on stalks known as calli. These bars distinguish it from the closely resembling White Finger orchid.